JROS held its annual coaching camps for M/W16s at Hawkshead Youth Hostel in the Lake District. This year saw 78 juniors and 42 coaches taking part in sessions organised on Holme Fell, Dale Park and Bishop Woods, report below. On Saturday evening Nick Lightfoot gave a presentation and workshop based on his recent work with individual Talent Squad athletes looking at Orienteering Racing; Principles and Training Ideas, which provided food for thought for both athletes and coaches. 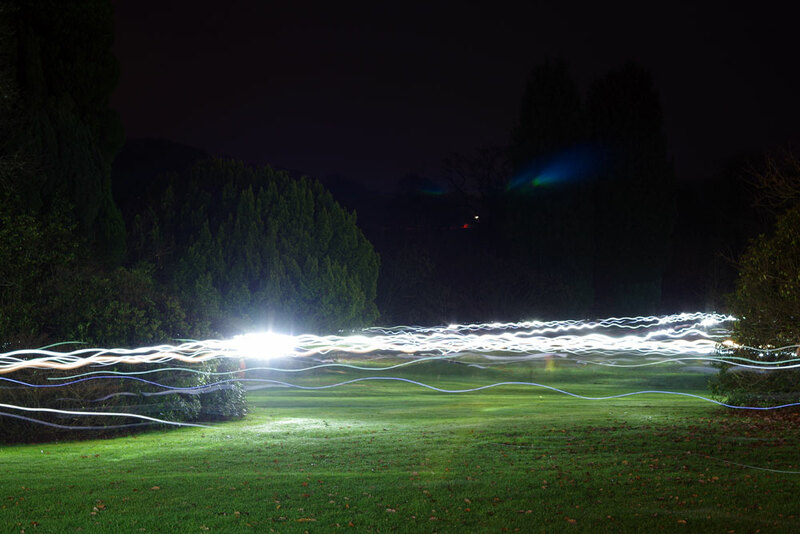 The mass start is always a spectacle as runners spread across the front lawn and headlights can be seen bobbing backwards and forwards as competitors move from one butterfly loop to the next. This year Steve Kimberley captured a flavour of the event with his photograph looking across the lawn. If you look closely you may see some ghostly figures who stood still a little too long. The first to finish in a time of 28mins 26secs was Tropic Thunder, a team of West Midlands coaches which contained Matt Elkington who had the fastest overall leg time of 8mins 20secs. A team from the South East comprising of Matthew Leitch, Sam Fielding and Jack Leitch were the first junior team back in a time of 32mins and 10 seconds. Red Leicester (EMOA) and the Flatlanders (EAOA) took second and third places. In the girls relay care overcame speed and the winners were WayAyePet, a mixed team from the NE and YHOA, comprising of Saskia Warren, Rebecca Aspin and Sarah Pedley in a time 50mins 3secs, followed closely in second by the Spinnies, an Irish team comprising of Eadaoin McCavana, Sophie Pruzina and Maebh Perkins. Overall the weekend had a great atmosphere where the juniors were having fun socialising with their peers but taking the training opportunities seriously at the same time. Nigel Benham from BML printing for providing the maps, Richard Tiley for obtaining all the permissions, Mel and her team at the Youth Hostel who were as efficient as ever getting everyone fed and Nick Lightfoot for his thought provoking presentation. It is now time to confirm details for the M/W 16s Hawkshead weekend. There are 108 places in total and we will need 9 for the forest teams. That works out at 8 to 9 places per region. It is anticipated that not all regions will take up all their places so add extra athletes to your standby list on the application form. I will allocate places once I have replies from all regions. As last year the plan is to have training in 2 or 3 areas and include an ultra-sprint night relay around the Hostel. I have asked Richard Tiley to seek permissions for Holme Fell, Summerhouse Knotts and either Dale Park, or Bishop Woods. As before I will aim to provide pre-marked maps with courses and control descriptions printed on waterproof paper for all juniors. Each coach/adult will have an all controls maps of each area. Exercises will be planned but it will be up to Regional coaches to decide how they would like to use the controls and areas with their groups. Let me know if your requirements are different or there is a specific exercise you would like planning. Meals and packed lunches will be as previous years: Saturday Breakfast, packed lunch and evening meal; Sunday breakfast and packed lunch. It has also been agreed that if needed, arrangements can be made for showering on Sunday before you head for home. Saturday evening I am looking for a speaker and/or workshop ideas so if you can offer any activity let me know. If you have any suitable older athletes who would like to be involved in the forest teams let me know so that I can send them invitations. Cost will be held at last year’s rate of £75 per athlete and coach. Please return the form soonest as this will help with allocating spare places so that regions can confirm arrangements with their athletes.